On a muddy beach near central Chittagong, Bangladesh’s second largest city, workers dressed in shirts and sandals use blowtorches to break apart the skyscraper-sized ships that tower over them. South Asia’s beaches form the epicentre of the shipbreaking industry, where shipyard owners compete to recycle the world’s ships on the cheap – at a high cost to workers and the environment. Every year, nearly a thousand vessels are dismantled worldwide, with 86 per cent of the world’s tonnage from end-of-life ships sent to scrap yards on the beaches of Bangladesh, India and Pakistan. Without a dock or harbour, ships are driven in at high tide and deliberately grounded straight onto the beach (‘beaching’) so workers can salvage the ship’s steel, often without specialist machinery or protection. in long-term diseases that they will get twenty years down the line. 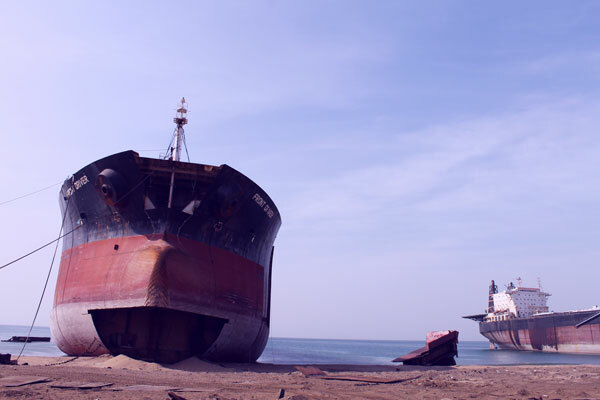 A beached vessel at Chittagong, Bangladesh. In November 2016, the worst incident in shipbreaking history occurred when an explosion aboard the oil tanker ACES killed at least 27 workers and injured 58 at a yard near Gadani, Pakistan. Almost exactly a year later, oil residues inside the tanker caught fire again after the Pakistan Department of Environment gave the go-ahead to resume the breaking of the ship. A 2013 report by the global union IndustriALL on the Gadani yard – actually a ten-kilometre strip of beach divided into 130 shipbreaking plots – found that no protective clothing, goggles, shoes or masks were provided. In addition, it found asbestos taken from ships formed a ‘mountain’ on the beach that children would often play beside. Anti-fouling paints containing copper, which deter organisms from growing on the ship’s hull, can similarly seep into the water. – is big business. In Bangladesh, it is estimated between 22,000 and 36,000 people are employed in shipbreaking, and the re-rolled steel accounts for half of the country’s total steel production. According to Jenssen, the South Asian shipbreaking industry boomed in the 1980s as shipping firms, including some from the UK and Europe, found ways to circumvent environmental and workplace legislation at home. Today, this is done through an intermediary ‘cash-buyer’ who enables the real ship owners to absolve themselves of their legal obligations simply by changing ownership, as well as the ship’s flag to a jurisdiction with poor law enforcement (‘re-flagging’), before selling the ship on to a beaching yard. to declare a ship toxic-free. “In many ways they [ship owners] are able to distance themselves from direct responsibility from having sold to a beaching facility. So a vessel will change flag, it will change name, even if it is only for the last weeks of its voyage,” says Jenssen. 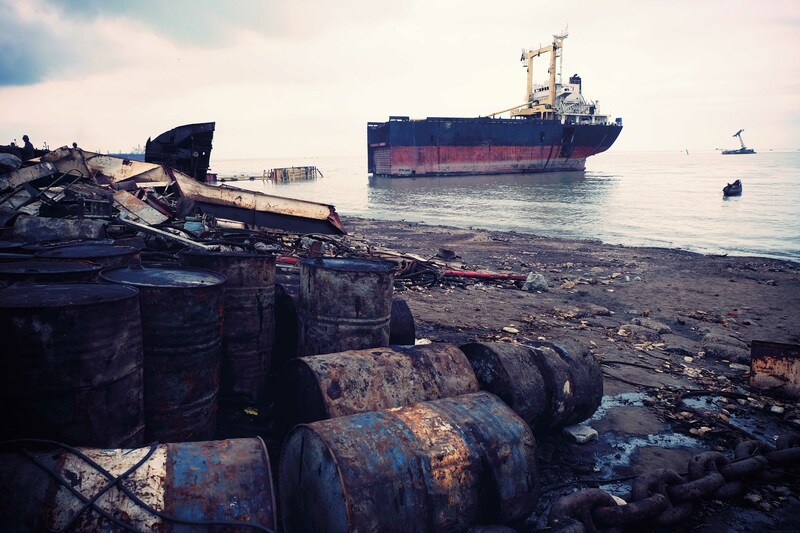 Cash buyers have been instrumental in allowing ship owners to avoid UN agreements such as the 1992 Basel Convention, which sought to prohibit the export of hazardous waste to developing nations. Then came the 2009 Hong Kong Convention for the Safe and Environmentally Sound Recycling of Ships, which attempted to agree international standards for shipbreaking, but didn’t ban the practice of beaching or regulate the disposal of hazardous waste. Nine years on and signatories are still waiting for the agreement to be ratified. However, the failure of the Hong Kong Convention – and mounting pressure from organisations in the Shipbreaking Platform – led the EU to adopt a new Ship Recycling Regulation back in 2013. Due to come in by the end of 2018, the EU Regulation will provide a list of approved ship recycling facilities for EU ship owners to use, excluding any that use beaching as a method of deconstruction. It will also ban the installation of hazardous materials on ships, like asbestos, and require an inventory of other materials on board. A key policy the Platform is pushing for is a ship deposit return scheme for all ships going through European ports. Its aim is to prevent ship owners from selling their end-of-life vessel to an unscrupulous cash- buyer, a sale which can save the owner a significant amount of money but which often comes with the knowledge that the ship will end up on a beaching yard. there should be a financial incentive to ensure proper enforcement of the regulation,” says Jenssen. the Shipbreaking Platform predicts will happen – then policy-makers will likely propose a legislative amendment in late 2018 or 2019. In the meantime, most of the world’s ships will continue to be dismantled with few safeguards for those working in the yards, and fewer regulations to prevent long-term environmental damage. Shipbreaking must take place in safe recycling facilities after at least 52 workers lost their lives preparing vessels for recycling in 2016, according to the NGO Shipbreaking Platform’s annual report. EU approves new Ship Recycling Regulations, but green groups say the law will not stop illegal shipbreaking. As the city rises up the development index, Bogotá’s waste services are undergoing structural transformation. Now Colombia’s waste-picking recicladores are fighting to play their part as services are commercialised.